I-195 is 3.5 miles long, and runs from the I-95/I-64 Bryan Park Interchange to the VA-195 Downtown Expressway in Richmond. The road was opened to traffic in 1975, and is mostly six lanes, and has a four lane connector to VA-195. It was planned in the 1960s as part of the Richmond expressway system. It was called the Beltline Expressway, and would have been a toll road.  Interstate money became available in 1968 when 1,500 miles was added to the Interstate System, and the development went forward as a toll-free Interstate highway. An unusual feature of I-195 is the mainline railroad (CSX Transportation) that occupies the median of the expressway. The railroad originally was the Atlantic Coastline Railroad, and was in a depressed cut through the West End of Richmond. That section was also called the Beltline Railroad, built in the 1890s. Since it was an existing transportation corridor, it was an ideal location for a six-lane urban Interstate highway. 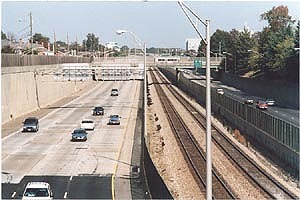 The northbound and southbound roadways were constructed on either side of the railroad, with high retaining walls at each edge of the expressway. Near the northern end of I-195, the expressway rises up onto a curving viaduct over the Acca Yards. The south end of I-195 junctions with two expressways, the Powhite Parkway, which heads across the James River to the southwest; and the VA-195 Downtown Expressway, which heads east to downtown Richmond, connecting with the I-95 James River Bridge. Above, I-195 looking north from Grove Avenue overpass. Photo taken October 2000. Click for large image: Large (130K). Above, looking north from Douglasdale Road overpass. Actually this is part of the Powhite Parkway, and the bridge in the distance is the eastbound semi-directional ramp I-195 connector to the Downtown Expressway. Photo taken October 2000. Click for large image: Large (203K). Above, I-195 southbound, approaching Patterson Avenue overpass. Photo taken April 1978. Click for large image: Large (57K). Above, I-195 southbound, approaching Acca Yards Bridge. Notice 900-foot-high TV tower in distance. Photo taken April 1978. Click for large image: Large (60K). The entire 10-mile highway system of the Powhite Parkway, Beltline Expressway, and Downtown Expressway, was being advanced toward construction in the mid- to late-1960s, but worsening national economic conditions, especially major price inflation which drove costs upward, was delaying construction. At that point, all three highways were being administered by the Richmond Metropolitan Authority (RMA), a local transportation authority that is a subdivision of the Commonwealth of Virginia. 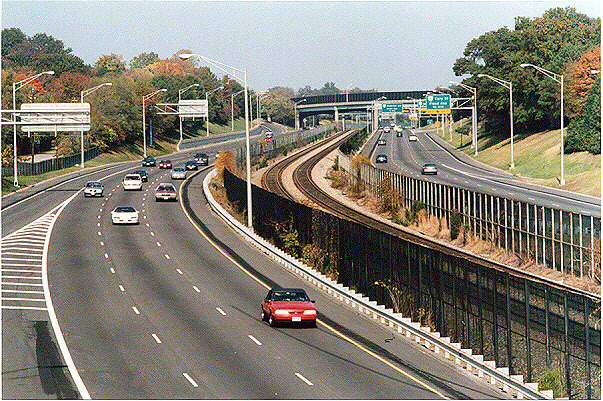 The key item that advanced the expressway plans was getting the Beltline Expressway added to the Interstate highway system as Interstate route I-195, thus obtaining approval for financing it with 90% federal funding from the Highway Trust Fund and 10% state highway funding, and thus obviating the former plan to use RMA toll revenue bonds to finance the construction of the highway. This provided for a toll-free I-195, and a considerably lower mileage that was to be built as toll roads; just the Powhite Parkway and the Downtown Expressway were built as toll roads. The following section is a direct quote from "Beltline Expressway I-195 Spur Built", The Virginia Road Builder magazine, by Virginia Road Builders Association, October 1974. Direct quotes are in blue text. In the Fall of 1968, the Congress added 1,500 miles to the National System of Interstate & Defense Highways. RMA, VDHT and other governmental and quasi-governmental agencies redoubled their efforts to get an allocation of Interstate mileage sufficient to build the Beltline Expressway as originally planned. They had failed in a previous conference with the U.S. Secretary of Transportation to get a transfer of funds from the authorized I-295, a proposed loop around Richmond, some distance out. Early in 1969, John A. Volpe was the newly appointed Secretary, a three-term Governor of Massachusetts, who had been President Eisenhower's first federal highway administrator in 1956. Virginia's newly elected Governor Linwood Holton headed the delegation from Richmond. 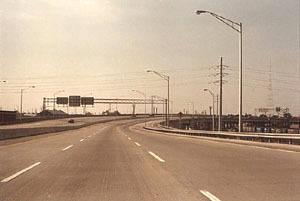 On July 18, 1969, Volpe approved the request for I-195, allocating 3.3 miles for its construction. RMA backed up the Department, and the key was turned in the deadlock. The present location of I-195 was fixed, unknowingly, 81 years before Mr. Volpe's action. The north-south corridor it now occupies was selected by the R.F.& P. R.R. [Richmond, Fredericksburg and Potomac Railroad] in 1888 for its new "James River Branch (Beltline)" which was to handle north-south freight traffic. An awkward connection with The Richmond & Petersburg line to the south, and numerous grade crossings with city streets precipitated construction of this relief route. From 1891 until 1910 it was a single-track line, with grade crossings at Broad Street Road, Grove Road, and Cary Street. Patterson Avenue was later projected across the railroad, and when the tracks were depressed in 1916-19, Monument Avenue was added. This area was annexed by the City [of Richmond] in 1914, and in 1916 the City ordered the railroad tracks depressed and bridges built, or rebuilt, since two grade crossings had been eliminated, with all street crossings overgrade. World War I conditions during this period, and drainage problems, hampered the excavation and bridge construction, but the double-tracked, depressed Beltline Railroad was opened simultaneously with the opening of the new Broad Street Station, on January 6, 1919. The total cost of reducing the railroad grade and construction of the four bridges (Broad St., Monument Avenue, Patterson and Grove Avenues), in 1919-1920 dollars, was $636,988. The depressed roadways for I-195 were built on either side of the depressed Beltline Railroad (Seaboard Coast Line Railroad then during construction of I-195, CSX Transportation today in 2000). Sheet piling was driven first, then the earth was excavated out of the area where the new depressed roadways would go, then concrete retaining walls were built just inboard of the sheet piling, then earth was backfilled between the retaining walls and existing ground outboard of the retaining walls. Once the excavation was complete down to the level of the new roadways, the two railroad tracks were temporarily relocated, one onto each new roadway grade, so that the depressed railroad grade could be lowered four more feet so that the railroad line could carry high-profile railroad cars. Temporary roadways and bridges were constructed for the streets that pass over the railroad, then the old bridges were demolished, and then new bridges that pass over the highway and railroad were built along the original street alignments. Then the railroad tracks were moved back to their original alignment, in a small trench with retaining walls, which is four feet lower than the highway roadways. Finally, the highway roadways were completed with the addition of subbase, continuously reinforced Portland cement concrete pavement, and hot-mix asphalt emergency shoulders. Near the northern end of I-195, the expressway rises up onto an S-curving 1,858-foot-long viaduct over the Acca Yards. The south end of I-195 junctions with two expressways, the Powhite Parkway, which heads across the James River to the southwest; and the VA-195 Downtown Expressway, which heads east to downtown Richmond, connecting with the I-95 James River Bridge. 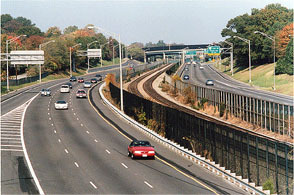 I-195 has 6 lanes from I-95/I-64 to the Powhite Parkway, and 4 lanes on the connector from the Beltline Expressway to the Downtown Expressway. 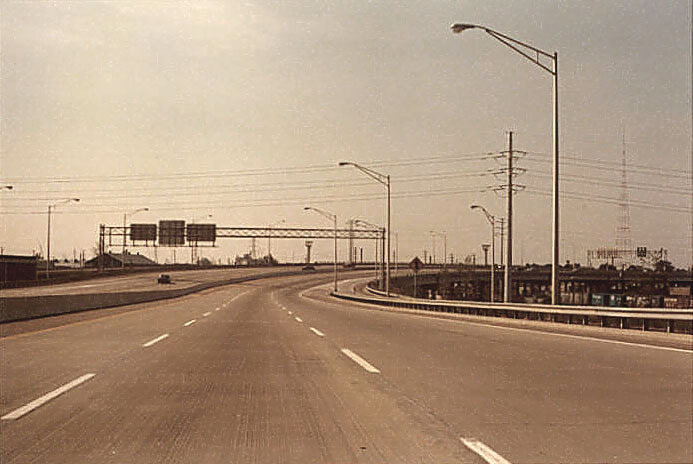 The 3.0-mile section from I-95/I-64 to Powhite Parkway was opened in 2 sections on July 15 and 19, 1975, and the 0.5-mile connector to the Downtown Expressway was opened on February 3, 1976. 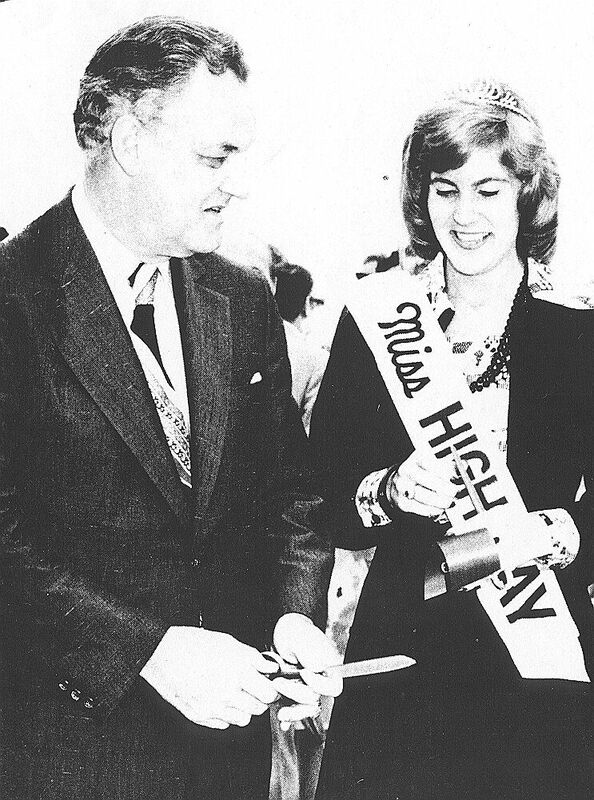 "A Ribbon Cutting in Richmond", BULLETIN, July-August 1975, Virginia Department of Highways and Transportation. Direct quotes are in blue text. On July 15, in a drizzle that threatened to become a downpour at any moment, about three miles of Richmond's 3.8-mile Beltline Expressway (I-195) was officially opened to traffic in ceremonies sponsored by the Central Richmond Association. The ceremonies took place at the north end of the highway's bridge over the Acca Yards of the Richmond, Fredericksburg and Potomac Railroad. The speeches were brief. Governor Mills E. Godwin, Jr., was the principal speaker, and his address (the text of which accompanies this article) drew attention to the uncertain future facing Virginia's highway program. After he spoke, he and Pamela Brooks, Miss Highway, cut the red ribbon that officially opened the road to traffic. Then the motorcade proceeded slowly southward. The article then went on to say that the $60 million six-lane expressway was the first highway in Virginia with trains utilizing the median strip, which included freights operated by the Seaboard Coast Line Railroad and passenger service by Amtrak and Auto-Train. Planning for the expressway began as early as 1959 when the City of Richmond retained the engineering firm of Howard, Needles, Tammen and Bergendoff to make the first major study of locating a north-south highway along the tracks. In 1966 the expressway was included in a proposed regional expressway system, along with the Powhite Parkway and the Downtown Expressway, and in 1969 it was designated as part of a spur connection of the Interstate system. The Department of Highways and Transportation then became responsible for its construction, which has been financed with 90 percent federal funds and 10 percent state highway user tax funds. A large portion of the Governor's speech was published in the article, and I'll quote a few key portions. Here he discusses the purpose of urban Interstate highway spurs in general, and with I-195 in particular. This is a section of the highway that was added to the Interstate system when it became apparent that speeding our highway traffic between cities with four-lane divided highways was only a part of the job, and that we would have to facilitate the movement through and around our cities if it was to take on its full potential. In this instance, we have an Interstate highway segment carrying traffic to and from the southside of Richmond and connecting eventually both with arterial highways east and west and with the Downtown Expressway. Here Governor Godwin discusses the planning wisdom that went into the location of I-195. Here we have a highway traversing the very heart of a city but creating a minimum of dislocation and environmental impact because, for much of its length, it utilizes and existing railroad right-of-way. More than that, it is an example of enlightened city planning, because this highway in only slightly different form has been a part of the City of Richmond's master plan for some 20 years. The construction began in May 1971 and the Beltline Expressway portion of I-195 opened July 15, 1975. 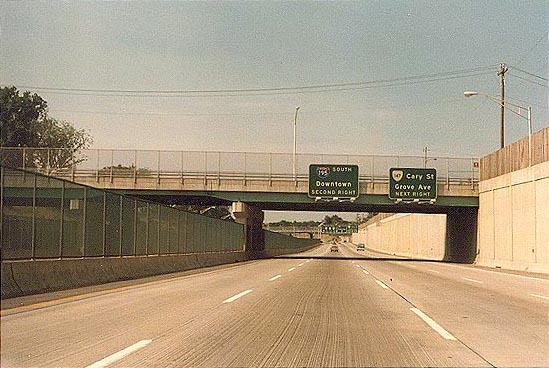 The I-195 connector to the Downtown Expressway opened on February 3, 1976 along with 2.7 miles of the Downtown Expressway. The "Beltline Expressway" name never caught on in public usage, perhaps because the name is not posted on any road sign. The highway is commonly known simply as "I-195" and local radio traffic reporters sometimes call it the "195 Beltline". I-195 Beltline Expressway - Construction Photos - Roads to the Future article with five photos of I-195 under construction. Richmond Interstates and Expressways - Roads to the Future article about the entire expressway system, of which I-195 is an integral part. This article shows how the whole system was planned and built, including how I-195 fits into the system. All photos taken by Scott Kozel, except photo of Godwin and Brooks. Copyright © 1997-2003 by Scott Kozel. All rights reserved. Reproduction, reuse, or distribution without permission is prohibited.